Mental illness can be a difficult topic to discuss. In his novel Imagine Me Gone, Adam Haslett attempts to grapple with the subject. He tells the story of a family who deals with the mental illness of their patriarch early on. When Margaret made the decision to marry John, she was aware of his depression. The novel follows the effects of John's struggles with depression and the way those difficulties impact his entire family. Haslett provides insight into each member of the family's unique reaction to mental illness by having each chapter alternate perspective to that of a different character. This approach can be illuminating at times while creating a distance between reader and character at others. I found the chapters about the mother and sisters to be particularly effective. They attempt to create some kind of normalcy within a family that is riddled with the uncertainty that mental illness can bring. Where the novel lost me was in the chapters of one brother in particular, Michael. Like his father, Michael suffers from mental illness that makes his chapters nearly impossible to comprehend. He has a particular obsession with music that was endearing at first. It was a way to form some kind of connection. Unfortunately, he seems to deteriorate over time, making his chapters more and more confusing and hard to connect with. While I think this is an intentional tool for Haslett to demonstrate the troubled mind of a man with severe mental illness, it makes for a book that is often difficult to follow. I have a very mixed reaction to this book because of that. On the one hand, I appreciate how Haslett uses Michael to help the reader understand the other family member's challenge of dealing with a loved one with mental illness. On the other hand, these portions were so uncomfortable to read that I nearly stopped reading the book all together. Imagine Me Gone is as brilliantly conceived as it is frustrating to digest. I can appreciate why the book has been so acclaimed, but I really struggled to connect with it. 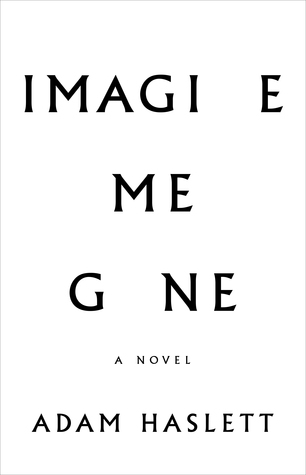 This entry was posted on Friday, October 13, 2017 and is filed under Adam Haslett,Book Review,Drama,Family,Fiction,Imagine Me Gone,Mental Illness. You can follow any responses to this entry through the RSS 2.0. You can leave a response. This is the type of read that might translate better into a movie, or work better on audio with multiple narrators. Great review Ethan. This book sounds amazing to me. It reminds me a little of House of Leaves. Not sure if you've heard of that book (it's a must read for everyone) but the book is similar to this. The further you enter the house the crazier the writing gets. It's quite interesting. I'm kind of obsessed with nontraditional novels. You might actually enjoy this one then! I'll have to look into House of Leaves.